History 101 is an original feature at The Pretty Good Gatsby and allows me to combine my love of history with my love of reading. Each post I’ll talk about an odd/interesting event or historical figure and then I’ll pair it with a book. 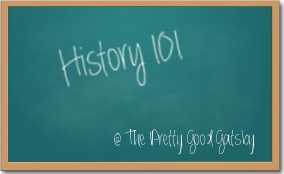 You can find all History 101 posts here, starting with the earliest. Will the Real Mother Goose Please Stand Up? Love this feature idea!! As a fellow history buff and lover of historical fiction, I cannot wait to become familiar with your posts.